Friday 12.7. Rowing stadium between 10.00 a.m. – 12.00 p.m.
Saturday 13.7. Hakovirta between 7.30 a.m. – 10.00 a.m., Rowing stadium between 08.00 a.m. – 12.00 p.m.
Sunday 14.7. Rowing stadium between 9.30 a.m. – 4 p.m.
Thursday 11.7. Rowing stadium between 8.00 a.m. – 11.00 a.m.
Saturday 13.7. Rowing stadium between 8.00 a.m. – 12.00 p.m.
Our pdf brochures are readable in e-publications. 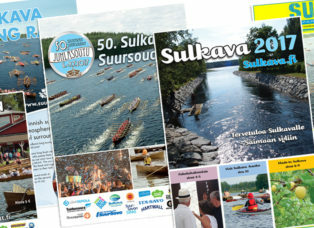 You can find here brochure about Sulkava Rowing Race and also our 2017 brochures in finnish.